“Attracting Birds in the Texas Hill Country” is first and foremost a habitat management tool. However, being well suited to those that own and manage land for wildlife benefits, this book will also interest those readers interested in birding, natural history, and landscape ecology. This isn’t to say that it is a heavy tome that dives deeply into complex paradigms and theories but it does introduce the concepts of holistic habitat thinking and the connectedness of life. All readers, from seasoned wildlife biologist to new landowners to the casual backyard birder, will come away from this book with an improved understanding of the challenges to declining and imperiled Hill Country birds. Readers will develop a deeper appreciation for today’s wonderful land stewards (of which there are many) and how the Hill Country’s man-made problems often require man-made solutions. The book is organized thusly; an introduction, 9 chapters, an appendix composed of 5 appendices, glossary, bibliography, and index. 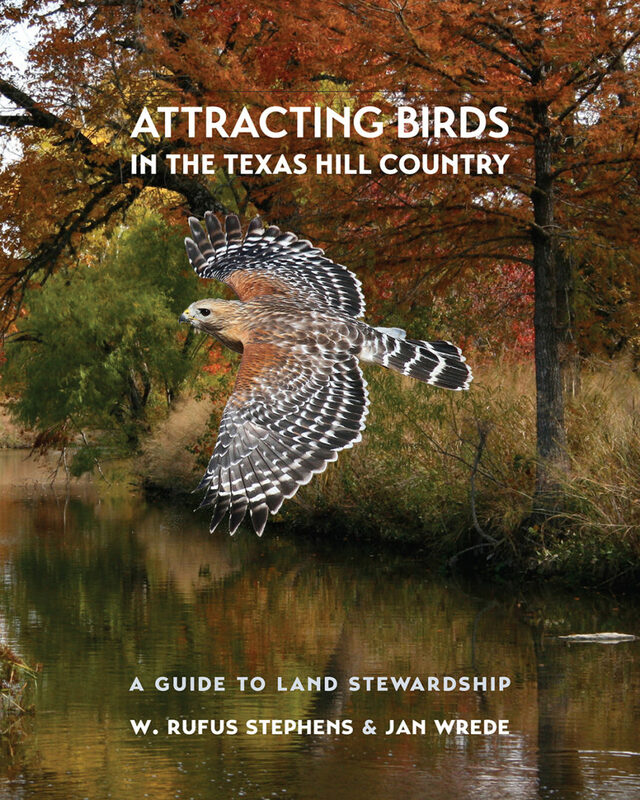 The chapters explore the specific challenges to habitat and avian species found within the Hill Country of Texas. The first six chapters are formatted to provide an overview of specific habitat types with treatments to assist in identifying healthy versus degraded versions. The remaining three chapters tackle specific challenges; predators, deer management, and cedar control. Each habitat chapter (chapters 1-6) explores several problems regularly observed within each of the habitat types treated, the likely causes of these problems, and management strategies to recover or restore the habitat to a more productive form. Since some of the problems (i.e. overgrazing) often occur within multiple habitat types, some chapters explore the problem with more depth than others. The authors are thoughtful about this and make it a practice to cite which chapters the reader can find more thorough treatments of problems. Stephens and Wrede do a great job of connecting specific Hill Country birds to the habitat with which they are most closely associated. They often remind the reader that species specific management is irrevocably tied to a habitat’s ability to provide food, water, and shelter for the species. Further, the authors stress that, as wildlife managers, we should focus our activities on improving or stabilizing these critical components. At the conclusion of each of the first six chapters, the authors switch the focus from habitat management to species specific accounts and management activities, cumulatively providing a treatment of nearly all regularly occurring bird species found within the Hill Country. I do have a few criticisms or suggestions to offer but none should substantially take away from the value of this book. I’ll preface these comments by stressing that these are my opinions and based in a matter of personal preference. First, although Stephens and Wrede include an abundance of photographs providing real examples of birds, habitat, and management activities, the layout is not impressive. A bold statement perhaps. However, this isn’t to say that the layout isn’t effective, it just lacks the graphically appealing appearance I’m becoming more and more used to seeing in semi-technical and popular publications. Second, I would prefer to see more diagram examples (like that associated with rotational grazing in chapter 2) to complement the management techniques explained within the text. I believe that this would benefit many readers lacking land and wildlife management backgrounds (like my mother whom loves birds but has a difficult time visualizing land/habitat management). Lastly, the organization of the book can be tricky to navigate. Since problems like overgrazing and high deer densities can affect multiple habitat types, they are addressed in multiple chapters with one chapter usually exploring the issue more thoroughly than the others. This requires the reader to regularly thumb through different chapters to access the full scope of the problem-specific content available. Whereas the authors usually reference the chapter with which this content is located, providing specific page numbers and/or a chapter by chapter table of content would reduce the necessity of skimming through pages of material in search of the referenced content. In conclusion, “Attracting Birds in the Texas Hill Country” is a valuable tool for bird lovers, wildlife biologists, and land stewards. Stephens and Wrede have captured a depth of knowledge and experience of the Hill Country that will benefit a variety of readers; a welcomed addition to both the professionals’ and enthusiasts’ library.